This data set provides measurements for foliar nutrients from logging blocks in the Tapajos National Forest, Para Western Santarem, Brazil. Data are included for calcium (Ca), phosphorus (P), magnesium (Mg), nitrogen (N), and potassium (K) concentrations. In March 2003, foliar samples were collected from the cover types remaining after selective logging in 2002: forest, tree-fall gaps, skids, roads, and deck areas. Fresh foliage was also collected in March 2003 from 192 upper canopy species at an intact forest site 17 km from the logging area. NOTE: The sampling sites and skid trails were not defined but are believed to be those found in the Asner et al., 2008 data set. 1 Sample_ID *Sample id: B=block #, R=road number, P=patio #, F, S,T, and R=location paired to the number of sample. -9999 represents data not provided with this data set. *The Sample ID description was taken from the data set " LBA-ECO LC-13 GIS Coverages of Logged Areas, Tapajos Forest, Para, Brazil: 1996, 1998", available from the ORNL DAAC. -9999 and "not provided" represent data not provided with this data set. These data were collected to demonstrate how the nutrient concentration changes from fresh foliage to litter after a selective logging event. The sampling sites and skid trails were not defined but are believed to be those found in the Asner et al., 2008 data set. The selective logging site is located in the northern part of the Tapajós National Forest (TNF) in Pará, Brazil, about 50-km south of Santarém, on a plateau that runs along the east side of the Tapajós River. The logging area is minimally bisected by drainages. The soils are 70% clay dominated (ultisols and oxisols) and 30% sand dominated (ultisols; Silver et al. 2000). Mean annual temperature is 25 degrees C and rainfall averages 2,000 mm yr-1 with most inputs during the wet season from January through June (Nepstad et al. 2004). tree-fall gaps, where the canopy falls and remains after being cut from the tree bole. In March 2003, four blocks logged between August and October 2002 were sampled. These blocks were located on clay-dominated (oxisols) soils. Samples were ramdomly selected from two logging decks from each block. Samples were collected along the roads leading to the decks every 10 m along a 40-m transect (n=5), and in the decks every 5 m along a central transect (25-m × 25-m) with three additional samples taken in the center spaced at least 2 m apart (n=7). Out from the decks, one skid was sampled every 10 m along a 40-m transect (n=5). At the first tree crown found, five samples were taken in and around the fallen crown (n=5). In the matrix of unlogged forest at least 10 m from any deck, skid, road, or gap, three to five samples were taken at 10-m intervals along transects (n=3 or 5) (Olander et al., 2005). Fresh foliage was collected from 192 upper canopy species at a site 17 km from the logging area. The species were selected based on relative abundance and comprised of all genera listed by Keller et al. (2001), and Asner et al. (2004). Foliage was shot from full sunlight positions using a shotgun, captured, and pressed for subsequent drying at 70 degrees C for five days. Samples were transported to the University of Brasilia for nutrient analysis using an ICP mass spectrometer (ICP-AES, IRIS/AP, Jarrell-Ash Corp., Franklin, MA, USA). Nitrogen concentration was measured by Nessler colorimetric method. Two analytical replicates per sample were analyzed using reference material (1547, Peach Leaves, NIST). 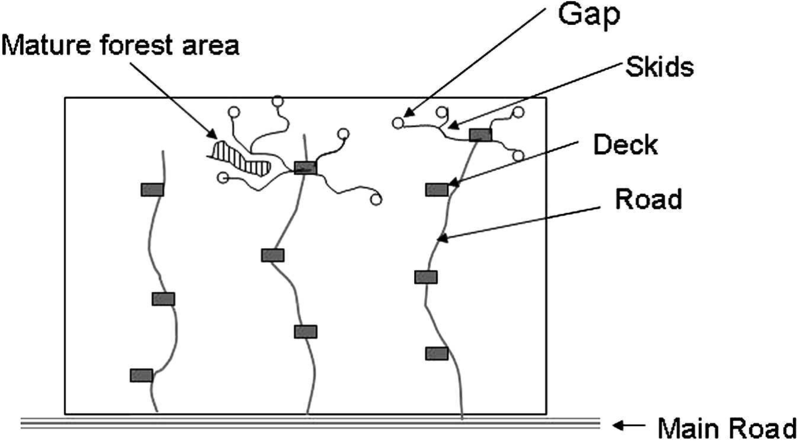 Data were partitioned by mature and pioneer habitat, as described by Parrotta et al. (1995). Asner, G.P., A.R. Townsend, M.M.C. Bustamante, G.B. Nardoto, and L.P. Olander. 2004. Pasture degradation in the central Amazon: Linking changes in carbon and nutrient cycling with remote sensing. Global Change Biology 10:844-862. Keller, M., M. Palace, and G. Hurtt. 2001. Biomass estimation in the Tapajos National Forest, Brazil: Examination of sampling and allometric uncertainties. Forest Ecology and Management 154:371-382. Olander, L.P., M.M. Bustamante, G.P. Asner, E. Telles, Z. Prado, and P. Camargo. (2005) Surface Soil Changes Following Selective Logging in an Eastern Amazon Forest. Earth Interactions Vol. 9. Parrotta, J. A., J. K. Francis, and R. Rolo de Almeida, 1995: Trees of Tapajos. U.S. Department of Agriculture Forest Service General Tech. Rep. IITF-1. Silver, W. L., J. Neff, M. McGroddy, E. Veldkamp, M. Keller, and R. Cosme, 2000: Effects of soil texture on belowground carbon and nutrient storage in a lowland Amazonian forest ecosystem. Ecosystems, 3, 193–209.